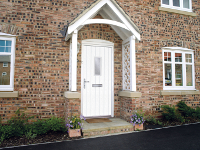 One of the UK's largest door manufacturers is reminding landlords and homeowners throughout Yorkshire to be ‘winter safe’. Coinciding with National Home Security Month (NHSM), which takes place throughout October, Barnsley-based Premdor aims to raise awareness surrounding home safety this winter by offering free advice relating to door and window security. Shocking statistics released by NHSM organisers indicate a 20% increase in home burglaries throughout the colder months as thieves take advantage of the greater number of hours shrouded in darkness. Dave Paxton, Technical Director at Premdor, believes that tenants and property owners should be reminded to check their windows and doors on the same day that the clocks revert back – the 26th October. Dave said, “As well as turning your clocks back one hour, spend a few minutes checking that your external door locks and night latches are fit for purpose and that each of your windows has at least one appropriate lock fitted to ensure your family’s security. Some may consider upgrading their locks to devices that can withstand drilling and picking to further deter wannabe burglars”. "Also, don’t forget the vulnerable, such as the elderly, this winter and ensure that spy holes and door chains are fitted. Winter is filled with festivities, but it can sometimes be a frightening time for the elderly who may not be sure who is at their front door!" For further advice and guidance relating to door and window security and locks and latches, please contact Premdor on 0844 209 0008 or alternatively, please contact Premdor direct. For additional ways to protect your property throughout the darker months, please visit the South Yorkshire Police website.